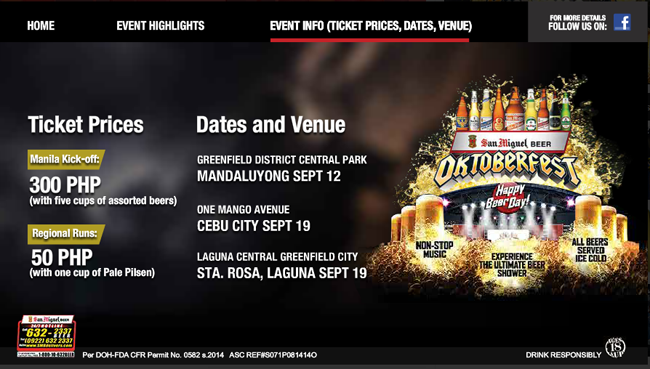 Gear up for the most awaited annual fall celebration, the 35th San Miguel Beer Oktoberfest Beer and Music Festival. Oktoberfest is a yearly event brought by one of the most famous brewery in the country, San Miguel Brewery Inc.
Laguna Oktoberfest will be held on September 19 at Laguna Central Greenfield City in Sta. Rosa, Laguna at 6pm to 2:30am. Mayonnaise,Razorback, Sassy Girls (formerly Pretty Young Things), DJ Ace Ramos, DJ Gavin Skewes, and Olay Yapanit would make you groove in the party nonstop. While at the same day and time party will also kick off in Cebu City at Mango Avenue Parking Lot bringing the bands Rivermaya, Deuce Manila, Drop Decay and Auctioned Band. Ticket price is Php 300 and Php50 pesos. Enjoy the 12 hours of music by famous bands while partying with celebrities like Sam Pinto, Efren “Bata” Reyes, Django Bustamante, Pepe Smith, Ely Buendi, Daniel Matsunaga, Liz Uy, Bianca Gonzalez, Ruffa Gutierrez, Richard Gutierrez, Raymond Gutierrez, Fabio Ide, Jake Cuenca, Divine Lee, Victor Basa, Georgina Wilson. The event is open to public with ages 18 and up so if you fortunately look younger than your age, don’t forget to bring your ID proving that you are not a minor. Bring your friends and also participate in side activities game booths such as darts, slingshots, pool, soccer and frisbeer in Laguna while billiards, Connect 4, Giant Jenga and basketball would be set up in Cebu. Storms and rain on the weather news? The Oktoberfest organizers had prepared tents for your protection. If the kick off parties are not with your place, worry not coz barangay- themed parties will be held in different parts of the country. Oktoberfest kicked off last September 12 in Greenfield District, Central Park, Mandaluyong. Music was brought not only by the Filipino’s beloved fans but also the bands coming from different universities. Oktoberfest Kick-Off Party is called by the Department of Tourism as an official festival of the country and will continue to bring colors to the beginning of ‘ber’ months every year.